Each year in the U.S., more than 300,000 people have heart surgery. To reduce risk of stroke for their patients, surgeons often will close the left atrial appendage, which is a small sac in the left side of the heart where many blood clots form, during these surgeries. Mayo Clinic researchers report today in JAMA that adding this procedure is likely the right choice for certain patients but not all. "Our study showed that this intervention is associated with reduced risks of stroke and mortality," says Xiaoxi Yao, Ph.D., a health services researcher at Mayo Clinic and the study's first author. "This is especially true for patients with pre-existing atrial fibrillation, who are at a particularly high risk of stroke." To reach these conclusions, Dr. Yao and her research colleagues used the OptumLabs Data Warehouse. The OptumLabs Data Warehouse contains de-identified administrative claims data, including medical claims and eligibility information from a large national U.S. health insurance plan, as well as electronic health record data from a nationwide network of provider groups. They examined the records of nearly 76,000 adult patients who had a coronary artery bypass or heart valve surgery between Jan. 1, 2009, and March 30, 2017. 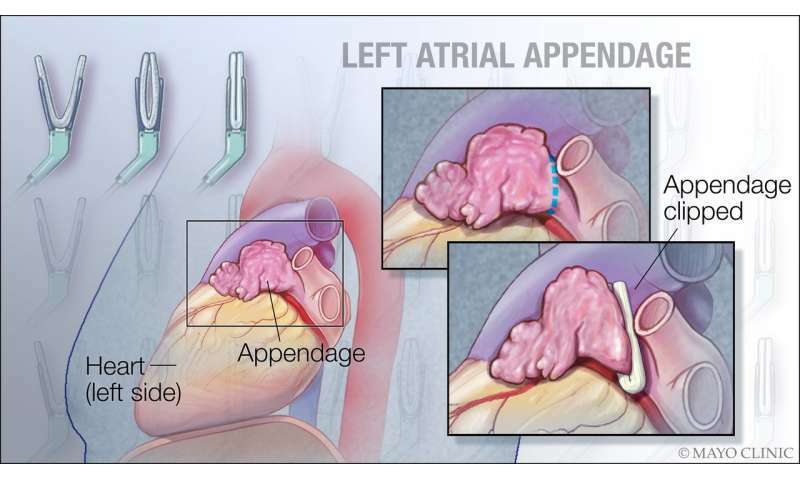 Of these patients, 5.8 percent (4,374 patients) also had the left atrial appendage closed during the surgery. The research team compared these patients to propensity score-matched patients who did not undergo the surgical closure, evaluating outcomes for 4,295 patients in each group. They found that patients who received the additional procedure were less likely to have a stroke. They were also less likely to die from any cause. If the patient had atrial fibrillation before surgery, the numbers were even more positive: lower risks of stroke or death. However, if a patient did not have atrial fibrillation before surgery, those undergoing the surgical closure became somewhat more likely to develop atrial fibrillation within 30 days after the surgery (27.7 versus 20.2 percent). Furthermore, in patients with and without pre-existing atrial fibrillation, the surgical closure of the left atrial appendage was associated with a higher rate of health care utilization related to atrial fibrillation, measured over an average of two years of follow-up. "Atrial fibrillation itself is a risk factor for stroke," says Peter Noseworthy, M.D., a Mayo Clinic cardiologist and senior author of the study. "So for patients who do not have atrial fibrillation to begin with, the potential benefit of closing the left atrial appendage now could be attenuated by later development of atrial fibrillation." "We saw that the benefit for patients with pre-existing atrial fibrillation was relatively large," says Dr. Yao. "We believe that may make it particularly attractive for patients who are not able or willing to take long-term anticoagulation medication, but we should stress that we have not formally tested whether these patients can safely stop their anticoagulation." The research team has collaborated on a number of projects centered on the safety and effectiveness of different treatments intended to reduce the stroke risk for patients with atrial fibrillation. "Our findings provide an important piece of information for decision-making," says Dr. Noseworthy. "Armed with this new evidence, physicians and surgeons can now discuss the pros and cons of left atrial appendage closure with their patients."